Millions of Americans face the financial hardships of losing a job, not being able to work due to a disability or supporting a family on a small salary each year. The struggle to put food on the table, pay bills and support a family can be incredibly harsh which is why the United States has a series of welfare programs to help those in need. Federal welfare programs first started in 1935 during the great depression. With widespread poverty, starvation and unemployment, a series of programs were created to help Americans place food on the table and help those unable to support themselves and their families. 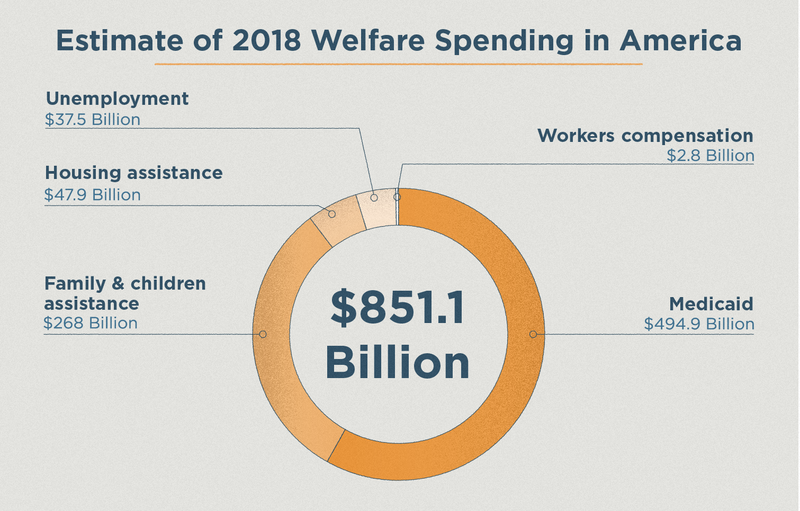 Today, the means-tested welfare system consists of 79 government programs that offer cash, food, social services, education, training and housing for low-income Americans. As welfare programs are both funded through local, state and federal taxes, programs are often a topic of political debate. With some misconception surrounding the Americans receiving welfare and effectiveness of the program, we have provided 45 important welfare statistics important for 2018. Explore the costs, effects and various demographic statistics in our study of the welfare programs in America. The total cost of poverty assistance programs in America can add up to a shocking $1 trillion a year when combining both federal and state level program budgets. Because of the large total price tag on helping the poor, welfare programs are often an area of policy and budgetary debate. Following the welfare reform act of 1996, government spending on welfare programs decreased as additional requirements and restrictions were put into action. Despite having less budget to pull from and more restrictions, the welfare programs in America have successfully lowered poverty rates over the past decade. Some issues with the current welfare program are its performance during years of economic downturn and recession. Compared to the average American household, welfare recipients spend far less money on all food consumption including dining out in a year. As families receiving welfare assistance on average have half the total spending in one year than families not receiving welfare there are some large differences in budgeting. Families receiving welfare spend on average 154 percent less on entertainment and 123 percent less on healthcare costs. Welfare fraud is the act of improperly stating or withholding information in order to receive higher payments. Most welfare programs’ eligibility is handled on a local level and detecting fraud is also the responsibility of the state. The United States Government Accountability Office estimates fraudulent or improperly filed charges account for 1 out of 10 payments. Although welfare programs are commonly argued to support the lazy, data does not show this to be true. In the current state, welfare programs predominantly help Americans who receive low wages. The U.C. Berkeley Labor Center discovered that welfare program participation is higher for Americans receiving minimum wages. Although a $1 trillion a year budget may seem large at first glance, the current welfare program consisting of 79 separate programs supporting 21 percent of Americans puts the large problem of poverty into perspective. Without any government safety nets, those living in poverty would not have the proper help to survive or tools to get back on their feet. With a rise in credit card debt across America it is still important to find a solution to pull the citizens living paycheck to paycheck out of poverty. If your credit has been damaged and you’re looking to improve your situation, contact Lexington Law. We can work with you to remove the negative items on your credit report that could be holding you back.